To be competitive in the upper amateur and professional divisions of disc golf, you're going to need a wide array of shot options. But isn't that what makes this game so fun? 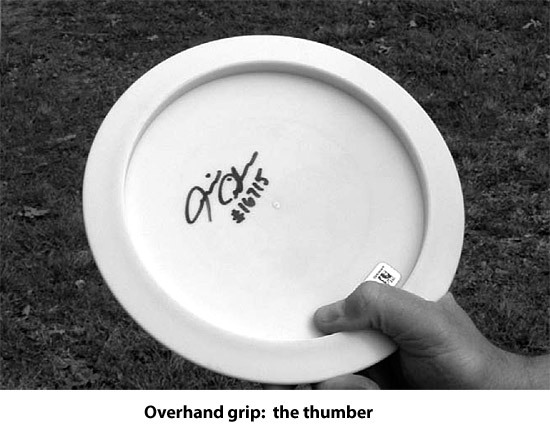 For me, the overhand shot has shaved more strokes off of my tournament disc golf rounds than any other alternative throwing technique. The overhand shot is primarily used to get up and over objects that are blocking the desired landing zone. However, throwers of the overhand shot will also tell you that it can be a valuable tool for pinpoint accuracy and controlled distance off the tee. I first saw players throwing overhand shots shortly after I picked up the game in the spring of 1999. Then, in the summer of 2000, I was fortunate enough to be able to compete in the 2000 Pro/Am World Championships in Ann Arbor, Michigan. I hung with or around the top ten advanced players for most of the week and got to witness one of the most deadly overhand shots I had ever seen by the eventual second place finisher, Curtis Gatlin. The effectiveness with which he was able to use this shot convinced me to dedicate some time to learning the technique for myself. After only investing minimal effort to learn the shot, it quickly became and remains an integral part of my game. The shot is easy to learn, even for newer players. Unlike the relatively unfamiliar backhand which requires perfect timing and awkward footwork, the overhand technique is essentially the same throwing motion used in other sports such as baseball and football. A few different grips can be used when throwing an overhand shot, however, there are two grips that are the most prevalent. 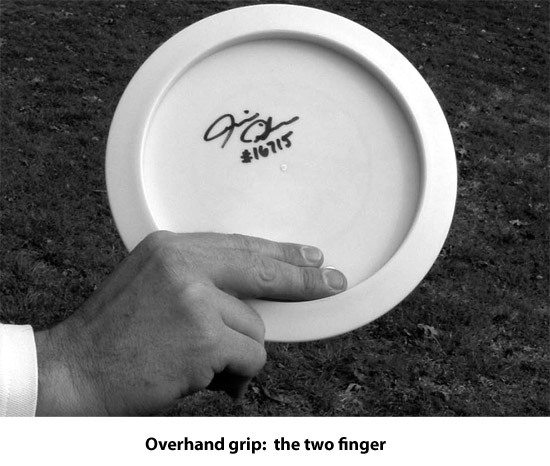 The primary difference between the two major grips is defined by whether the disc's flight plate is faced towards the thrower (referred to as a "two finger pan") or away from the thrower (referred to as a "thumber"). To perform an overhand throw using the two finger pan grip, start by placing the disc between your thumb and index finger with the flight plate facing towards you. Next, place your middle and index fingers along the inside rim of the disc and pinch the disc with your thumb. Your ring and pinky fingers are curled against your palm and do not contact the disc. 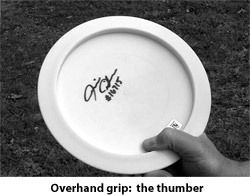 To execute the "thumber" grip, place the disc between your thumb and your index finger with the thumb on the inner rim. Next, pinch the disc by placing your index finger along the flight plate. The other three fingers do not contact the disc and are curled against your palm. The actual throwing technique is relatively simple. The shot is characterized by a throwing motion where a player reaches back with the elbow bent and then thrusts forward straightening the arm and snapping the wrist to release the disc over head in a vertical or near-vertical position (i.e., a baseball throw). The run-up involves at least three steps, beginning and finishing with the foot opposite of your throwing hand. To envision the run-up, imagine a center outfielder trying to throw out a runner at home plate (releasing with more height, of course). After release, the disc will follow a corkscrew flight pattern, usually rotating at least 180 degrees prior to finishing (typically the more overstable a disc is, the less it will rotate). When performed correctly, the overhand technique can effectively negate objects that would otherwise block your shot from your intended landing zone. As mentioned above, the advantages to the throw are fairly obvious. Instead of having to contend with menacing branches that the course designer strategically positioned for your shot to find, you now have a high percentage option that will almost assuredly advance you down the fairway. Got Daylight Above? 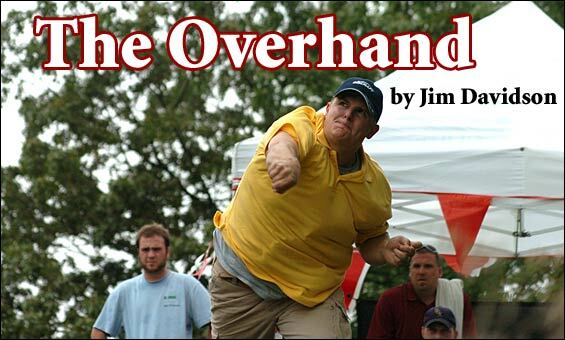 Try the Overhand! The technique is most useful on holes when there is daylight overhead and the traditional routes are lined with punishing tree branches or other hazards. A good example of this type of hole can be found at the Circle R Ranch in Wimberley, Texas (Rolling Meadows Hole #12). I have also found the overhand useful on open holes where out-of-bounds runs along both sides of the fairway making shot placement the primary objective (i.e., Winthrop Gold Hole #11). There are other ways the overhand can shave strokes from a round. One such scenario is when a shot is needed to travel a short distance down a tight fairway and then turn to the right (right handed thrower) or to the left (left handed thrower). Throw the shot as described above, except release the disc lower with the disc angled away from the body. The goal of the shot is to have the disc hit the ground on the flight plate, causing it to jerk violently to either the right or left depending on which hand was used to make the throw. Professional disc golfer Jim Davidson lives and plays disc golf in Texas. As is the case with all of the throwing techniques, there are a few disadvantages to the overhand shot. First, wind can have a significant impact on the disc because the disc is in vertical and near-vertical positions throughout much of the flight. This creates a larger amount of surface area (think of a sail) for the wind to affect versus a traditional throw where the flight plate of the disc is parallel to the ground. Another disadvantage is a result of the unpredictable manner in which the disc falls to the ground. As discussed above, unwanted bounces and rolls away from the intended landing zone are not uncommon. Another factor to consider when evaluating shot selection is the type of tree canopy that the disc may have to fall through. Because the disc reaches higher elevations than most other throws, the disc often passes through more tree branches as it descends, thus increasing the chance that the disc will get caught above two meters. In addition, it is fairly common for players to feel some elbow soreness after a round when they have thrown a few overhand shots. If this occurs, lay off the overhand shots for a little while to give your elbow a chance to mend. When picking a good overhand disc, you should give the experimentation process the same attention that you would when selecting your go to mid-range or driver. I feel the best overhand discs generally meet three criteria: the disc should be low-profiled, stable or overstable, and durable. The best overall overhand discs I have found are the Z-Predator and the Pro-D Venom. I prefer the Pro-D Venom, but because of the incredible durability of Z-plastic, I sometimes elect to carry the Z-Predator instead. I throw the Z-Xtreme (an incredibly overstable disc) when my main objective is maximum distance. The overstability of the Z-Xtreme causes it to turn very slowly, allowing it to fly further than any other disc I have used for this shot. Be sure to take into account the conditions of the landing zone. The optimal landing conditions are soft soil and relatively flat terrain, which provide the smallest chance for the disc to take an unwanted bounce or roll. Rocks, tree roots, hard ground, etc. can negate a good overhand shot by causing the disc to deflect away from the preferred landing zone. The use of the overhand shot seems to vary by region. It's popular in my home state of Texas, where small to medium sized trees and underbrush cover much of the state. The overhand shot is less useful in other parts of the country where massive old growth forests are predominant, like the Pacific Northwest. At the Beaver State Fling in Oregon last year, I left only one overhand disc in my bag and made room for a backup driver or midrange disc instead. I should note that although the overhand is an incredibly useful shot that can prove invaluable in certain situations, its distance limitations (for 99% of players) warrant that it be combined with a solid backhand or forehand. A solid backhand and/or forehand shot is still, after all, essential to mastering the sport. However, having many shots to pull from is one of the defining traits of a seasoned player game. 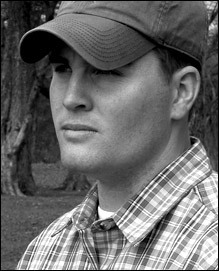 Get more disc golf tips from Jim Davidson on his Team Discraft page.